With water-activated moisturizing serum & 5 curve-sensing blades with skin guards to help protect skin from irritation, the Schick Hydro Silk® razor leaves skin feeling silky smooth! Find out why women prefer it to Venus Embrace. The razor head is surrounded by a water-activated moisturizing serum that hydrates skin throughout each shave and for up to 2 hours after shaving. 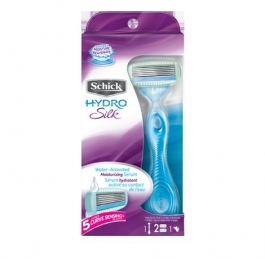 Designed specifically for the contours and curves of a woman's body (even those hard-to-reach places), each Schick® Hydro Silk® razor features 5 curve-sensing blades with skin guards to smooth skin as you shave, helping to reduce irritation while providing incredible closeness. Featuring a look that's inspired by water, the ergonomic handle is easy to grip and provides great control during your shave. The handle is designed to keep the cartridge out of water when placed on a flat surface. *Moisturizes for up to 2 hours after shaving.